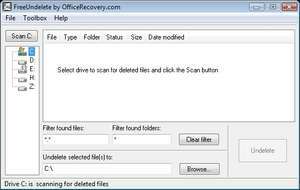 FreeUndelete is a freeware application for easily and quickly recovering files which may have accidentially been deleted. It is native to the NTFS file system and can also recover files lost on a FAT32 system such as those on Windows XP. The interface of this utility is pretty straight forward and using this program to recover deleted files is pretty effective. Whether your files ended up in the recycling bin or not, FreeUndelete can recover it. Version 2.0.0930 is a freeware program which does not have restrictions and it's free so it doesn't cost anything. For security reasons, you should also check out the FreeUndelete download at LO4D.com which includes virus and malware tests. Additional screenshots of this application download may be available, too. 5 out of 5 based on 1 rating. FreeUndelete has a presence on social networks.